D’vee Buss and Mark Davis tout their school spirit in Husker apparel. All events from Glow Big Red and the CoB kickoff offered from February 11-15 comprise Charter Week. The celebrations during that week commemorate the university’s charter date of February 15, 1869, marking a 150-year legacy at Nebraska. For Glow Big Red, people are encouraged to celebrate the anniversary four ways: Light It. Fly It. Wear It. Give It. Huskers around the world also have the opportunity to “Give It” and show their support for the College of Business through an online donation. People can make a gift to the college through two different funds: the Greatest Needs (Start Something Fund) and Student Scholarships. With more than 40 years of her career spent at the college, Dr. D’vee Buss, assistant dean for undergraduate programs, still gets that warm, fuzzy feeling every time she donates. “No matter what that amount is, donations make an impact collectively on someone’s life and make a difference. Being an employee of the university allowed me to get my masters and doctorate degree. It allowed my children to come to school and get their degrees here. So for me it is about giving back for what the college and university has given me all these years,” expressed Buss. Another way to celebrate is through the “Wear It” call, which emboldens people to adorn themselves in Husker gear to display their pride. 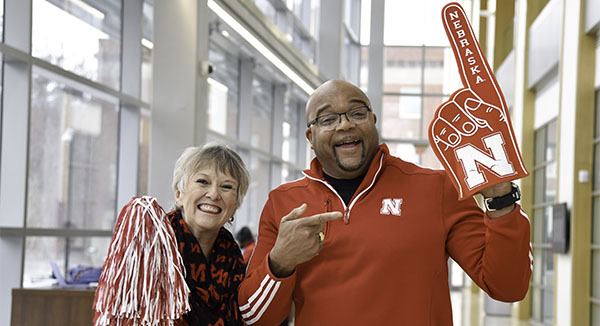 Mark Davis, an academic advisor at the College of Business, cherishes traditions like wearing red the Friday before Husker football games, signifying the bond they create. “Traditions cross all kinds of barriers and brings people together. It is something passed on from one class or generation to the next. Here at Nebraska, Husker pride is what unites us and rallies us together. You wear red to show your support of the Huskers. I am excited to show my school spirit and cannot wait to wear my red. I think it is great we’re celebrating this historic landmark,” said Davis. Some of the other events happening include the unveiling of a new ice cream flavor from the Nebraska Dairy Store, “Nifty 150” and a musical performance at the Lied Center for Performing Arts, featuring hit songs from the past 150 years telling the story of Nebraska. “I’m so excited about Charter Week, knowing this gives us an opportunity to think about new traditions and ways to celebrate the university. ‘Light It. Fly it. Wear It. Give It.’ encompasses everyone, no matter what, so all can participate in this celebration,” said Buss. To learn more about Charter Week and the many events included, visit: https://n150.unl.edu/celebrate-150/charter-week.